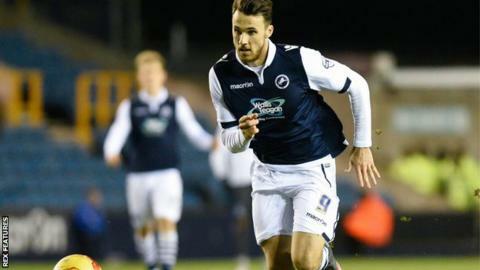 Millwall kept up their League One promotion push with victory at struggling Chesterfield. Sam Morsy's 25-yard strike put the hosts ahead, but Aiden O'Brien headed in Shane Ferguson's cross to level. Lee Gregory scored the winner from 10 yards early in the second half. Keeper Jordan Archer denied Morsy and Byron Harrison to seal victory as Millwall moved into the play-off places, and left the Spireites two points above the relegation zone. "For us as a group to break into the top six in January is a fantastic achievement. It gives us something to grow from. "It's terrific to come to Chesterfield away from home in January and show character and resilience to come back and win. "I'm really delighted with my players. "We took care of the ball, and if we do that we've got players who can hurt the opposition." Match ends, Chesterfield 1, Millwall 2. Second Half ends, Chesterfield 1, Millwall 2. Attempt missed. Emmanuel Dieseruvwe (Chesterfield) right footed shot from outside the box misses to the left. Substitution, Chesterfield. Emmanuel Dieseruvwe replaces Drew Talbot. Attempt saved. Steve Morison (Millwall) right footed shot from a difficult angle on the left is saved in the top right corner. Corner, Chesterfield. Conceded by Jordan Archer. Attempt saved. Byron Harrison (Chesterfield) header from the right side of the six yard box is saved in the centre of the goal. Substitution, Millwall. Joe Martin replaces Shane Ferguson because of an injury. Corner, Chesterfield. Conceded by Shane Ferguson. Substitution, Chesterfield. Byron Harrison replaces Sylvan Ebanks-Blake. Attempt saved. Sam Morsy (Chesterfield) right footed shot from outside the box is saved in the bottom left corner. Attempt missed. Jed Wallace (Millwall) left footed shot from the centre of the box is close, but misses the top left corner. Attempt missed. Gboly Ariyibi (Chesterfield) right footed shot from the right side of the box is just a bit too high. Attempt missed. Lee Gregory (Millwall) right footed shot from the centre of the box is close, but misses to the right. Corner, Millwall. Conceded by Lee Novak. Attempt missed. Byron Webster (Millwall) header from very close range is just a bit too high. Corner, Millwall. Conceded by Charlie Raglan. Corner, Chesterfield. Conceded by Shaun Cummings. Attempt missed. Lee Gregory (Millwall) header from the centre of the box is just a bit too high. Goal! Chesterfield 1, Millwall 2. Lee Gregory (Millwall) right footed shot from the centre of the box to the bottom left corner. Assisted by Jed Wallace.